One of the greatest uses of the pressure cooker is to quickly tenderize cuts of meat. Spareribs can roast in the oven for hours. In a pressure cooker, they're nice and tender in less than a half hour. To make this recipe as simple as possible, I used a store-bought barbecue sauce for this recipe. I selected a good one: Stubb's Hickory Bourbon. As I mentioned on Monday, I did have an instance of my pressure cooker not coming up to pressure as expected, possibly either because a valve was clogged or the lid wasn't on right. It happened when I made this dish. Because of that, it boiled for a long time before I fixed the problem and got it cooking under high pressure. So when I made this, I only cooked it under pressure for 15 minutes. But I think 20 minutes is probably more reasonable if you're doing this right. That's the amount of time in the source recipe for pork loin ribs (better known in the U.S. as "baby back ribs") from the Pressure Cooker Cookbook that I used to inform this dish. I changed the dish in a few ways by substituting spareribs, browning the meat first and changing the sauce a little. I served these ribs with truffled mac & cheese and simply prepared collard greens. 1. Heat vegetable oil in the pressure cooker pot over medium-high heat. Brown spareribs in batches, about 2 minutes per side. Set ribs aside as they are browned. 2. Add the barbecue sauce, water, honey and seasoned salt to the pot. Place the ribs in the pot, turning to coat with the sauce. Lock the lid into place and cook over medium-high heat until high pressure is reached. Reduce heat to medium-low and cook at high pressure for 20 minutes, adjusting heat as necessary to maintain pressure. Use a quick-release method (using a release valve or the cold-water method) to quickly depressurize the pressure cooker. Carefully remove the lid to vent any remaining steam away from you. 3. Preheat oven broiler with oven rack about 7 inches from the broiler. Remove the ribs from the pressure cooker and transfer to a baking sheet with the meatier side facing up (you might want to line it with aluminum foil). 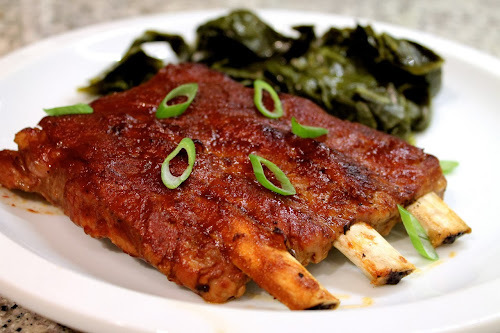 Brush the rib racks with additional barbecue sauce. Broil for about 3-5 minutes to brown the tops (watch to prevent burning). Serve topped with a few scallion slices and with some additional sauce on the side. Sorry the pressure cooker didn't work the way you expected, but this still turned out to be a pretty great meal. Thanks for making it for us! Forgot to get the spareribs in the crock pot before I headed out today so I have been looking up how to do in my pressure cooker which I use a lot!! I do so identify with you about making something and having the pressure not go up. Turned out one of my 4 qt pressure cookers is really picky about the handles and if they aren't screwed in tight and have any leeway they don't make a tight enough seal!! But today I am using the Presto not the Mirro and it never (yet) has had that problem. This recipe seems like a neat one and am about to put the meat in the pressure cooker and close her up! Thanks for the recipe. Interesting. I haven't had this problem again with my cooker. I think you're right that you have to get the seal just right, and sometimes you can't tell if there's a problem. Glad you like the recipe. Made these for my dad tonight. He loved them! Thanks for the recipe. Wonderful! Thanks for sharing. I'm glad it worked out well. It's amazing what you can do with a pressure cooker.